Last summer, hanging out at most bars or restaurants meant swimming in a sea of millennial pink rosé. While it’s still the norm to see glasses of the rosy wine everywhere you go, a vibrant reddish-orange hue has been added to the mix as more drinkers notice the appeal of the Aperol Spritz. 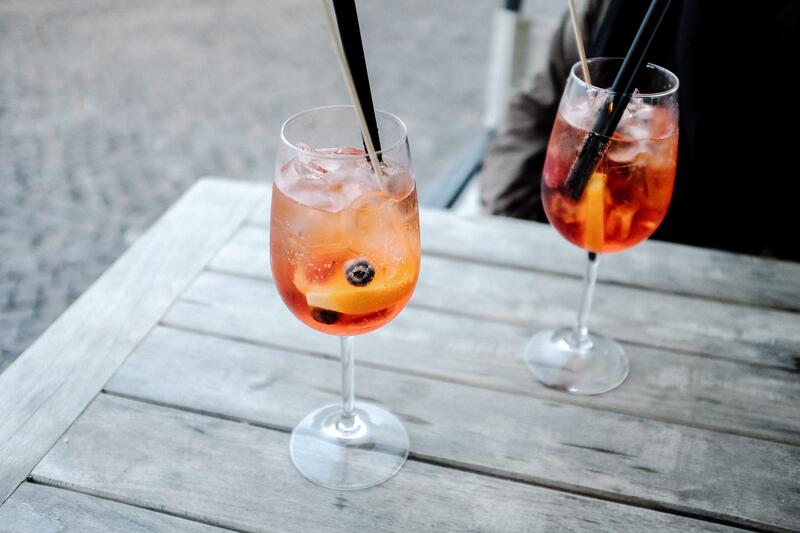 The sudden surge in popularity of the effervescent beverage has prompted many to refer to the Aperol Spritz as the drink of Summer 2018. Chances are good that you’ve tried the refreshing beverage while at a bar some point in the past few months, which the New York Times points out is largely due to a clever marketing campaign, but have you ever tried making it yourself? According to April Wachtel, a cocktail instructor and the founder and CEO of the craft cocktail-mixer delivery service Swig + Swallow, Aperol Spritzes are actually “incredibly simple” to make. “There are a lot of cocktails that are easy to mess up – this is one where it’s really difficult to make any big mistakes with it,” Wachtel tells us. The reason it’s so unlikely that you’ll make an Aperol Spritz incorrectly is that the ratios can be widely varied. Wachtel says that at least one of Aperol’s branded recipes calls for three-parts Prosecco, two parts Aperol, and one part soda, but that can be altered to fit the drinkers’ preferences. “If you’re somebody who does drink either Aperol on the rocks or Negronis – which are made with Campari, classically – you can do a lot higher ratio of Aperol to Prosecco to soda, but the point is that as long as you’ve got all three of those components, it’s going to be an Aperol Spritz,” Wachtel explains. We understand wanting to run full speed ahead at a trend, especially one this delicious and Instagram-worthy. However, there are still almost two whole months of summer left, so the classic Aperol Spritz could begin to taste a little tired. Wachtel has several suggestions – both small tweaks and significant changes – to help combat drink fatigue. She explains that the Aperol Spritz in its most classic form is garnished with an orange slice and an olive. However, she adds, “I personally love switching things up with different twists.” Wachtel recommends trying out orange twists, lemon twists, and grapefruit twists to experience the subtle differences in flavors brought out by each. Just as frosé became an extraordinarily trendy variant of rosé, frozen Aperol Spritzes have also begun popping up on summer drink menus. If you have a blender, Wachtel says you can make a dressed-up version of the drink above by blending Aperol, fresh lemon juice, simple syrup, and ice, then topping it off with Prosecco. Adding that bit of lemon juice and simple syrup is a good way to cut down on Aperol’s bitterness, if it’s not a flavor profile you’re entirely sold on. If you want in on this drink trend but don’t know if you like that bitter taste, another variation that might work for you is turning it into a shandy by mixing Aperol with a wheat beer and grapefruit juice. You could even try this with a cheaper, Pilsner-style beer, like a Miller High Life or a Narragansett. As we reach the true dog days of summer, and you’ve tried what feels like every Aperol trick in the book, you might start feeling less inclined to regularly mix up cocktails worthy of veteran mixologists. When that starts to happen, Wachtel says it might be fun to try using Aperol as a floater for other drinks. In case you’re unfamiliar, floating is a bartending technique that involves layering a liquor on the top of a cocktail. You’ve probably seen it done. “As crazy as it’s going to sound, I bet you [Aperol] would be a very delicious floater for a frozen piña colada or a margarita,” Wachtel throws out. This sounds extremely refreshing for when it starts to get unbearably hot, especially if someone else makes the margs and you just add the Aperol. Aperol Spritzes may require a little bit more work than rosé, but that also means there’s a lot more room to play. And, isn’t that really what summer is all about? Go forth and mix this summer’s biggest drink trend, any way you want. This article was written by Olivia Harrison from Refinery29 and was legally licensed through the NewsCred publisher network. Please direct all licensing questions to legal@newscred.com.